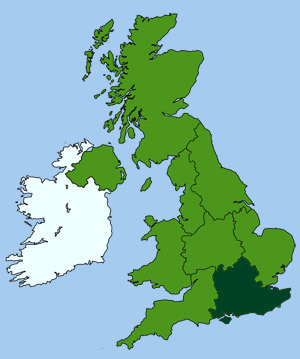 London has been an important city since the Romans first settled here in AD43 and constructed the first bridge over the Thames (not far from the site of current London Bridge). The original Roman walls are still visible in parts, enclosing an area of around one square mile. Today the city centre is still referred to as the 'Square Mile'. A name that also indicates Great Britain's financial services and commercial sector. The Bank of England museum reiterates the history of London's financial might, whilst the Museum of London tells of its humble origins, from Roman times, right up to the heady days of Victorian splendour and beyond. Just down river sits the impregnable fortifications of the Tower of London. The Tower is associated with many grim tales of imprisonment and execution. At its heart is the White Tower, built by William the Conqueror, containing a collection of armor and weapons and the spectacular British Crown Jewels. Spanning the Thames (alongside the Tower), is the iconic Tower Bridge, an important indication of the City's maritime prowess. 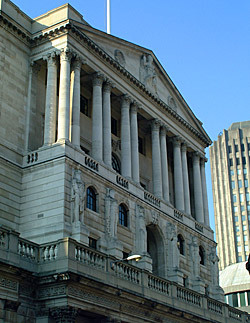 The 'Old Lady of Threadneedle Street' holds the nation's gold supply and issues banknotes. The museum charts the history of the Bank since its inception in the early 18th-c. A range of exhibitions and displays illustrate the bank's 300-year-old history. Dr Samuel Johnson, author of the first English Dictionary, lived in this 14th-c house between 1748 and 1759. The dictionary took over nine years to complete, covering some 40,000 words. The house contains many artifacts from Dr Johnson's life, including portraits, prints, letters and other memorabilia. Unique museum of English interior design and furniture. Located in a group of elegant 18th-c properties and set in lovely restored historical gardens. London's ancient Guildhall (or town hall), is a fine medieval building surrounded by modern office blocks. The structure was extensively restored after damage in the war. Inside there is a bronze statue of Churchill, unveiled in 1955, and huge wooden figures of the mythical giants Gog and Magog. The clock museum contains one of Britain's most important horological collections. With over 700 antique clocks, watches and other historic time-pieces; covering some 500 years of time-keeping history. The Art Gallery displays paintings of great state occasions over the last 100 years, including paintings and drawings of old London. 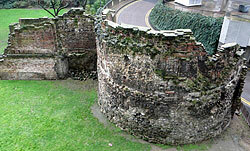 Built over part of the original Roman fort, the museum portrays London's history from Roman times to the present. 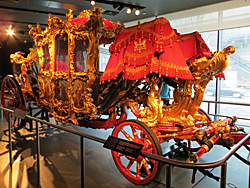 Exhibits range from skulls of the decapitated victims of Queen Boadicea's massacre in AD 61 to the highly ornate 250 year old, Lord Major's Coach (shown right). Set across two floors, you will need at least two hours to see it all properly. Follows the original route of the old Roman Town Wall through the city (approx. 2 miles). Starting at the Tower of London, the walk runs via the Museum of London and takes in a number of information panels (some of which have unfortunately been removed). The remains of Cripplegate Roman fort plus outcrops of preserved Roman wall and other Roman artifacts can be seen along the way. England's most famous cathedral. Rebuilt in 1708 by Sir Christopher Wren following the Great Fire of London in 1666. The cathedral is 157 metres long and 76m wide. At its centre is a great dome, painted with incidents in the life of St Paul. Vistors can climb the 560 steps to the top of the dome for one of the best views in London. Part way up is the Whispering Gallery, a balcony that runs around the inside of the dome. Named so because even the sound of a whisper will flow around its curve to be heard on the far side. In the Crypt (which is also open to visitors) are the great tombs of Nelson and Wellington. Wren is also buried here but in a more modest grave. 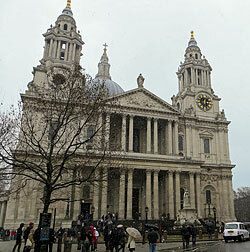 St Paul's facade (shown right) was famously used as a backdrop for several scenes in the 1964 film 'My Fair Lady'. Finely preserved medieval fortress, built by William the Conqueror in the 11th-c. Since then, it has been a prison, a place of execution, an arsenal, a zoo and is now home to the world's greatest collection of medieval armour, plus the spectacular British Crown Jewels. The main places to see are the White Tower (so named because in medieval times it was whitewashed within and without). The Bell Tower where Thomas More and Bishop John Fisher were imprisoned and the Bloody Tower where Sir Walter Raleigh was held. Also of interest is the Royal Chapel of St Peter, where two of Henry VIII's wives (Anne Boleyn and Katherine Howard) are buried. Just outside the church a paved area marks the spot where the two queens were beheaded. 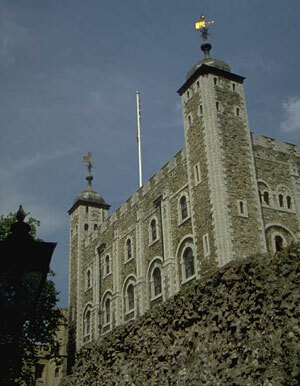 Legend states that the Towers invincibility is based on the continuing presence of the Tower's black ravens, who are cared for by the red-coated Yeoman Warders (Beefeaters). Regular, free guided tours by the Yeoman, provide a fascinating insight into the history of this famous fortress, and should not be missed. The Tower is very popular in summer, so it is best to visit as early as possible after the Tower opens in the morning. Restored Methodist chapel built in 1778. Contains the original pulpit from which John Wesley preached. Wesley's tomb is located in the church graveyard. The museum covers the development of Methodism from the 18th-c to the present day.